The church of Saint Pancras in Yvoire is very old and has known many changes. Classified Historical Monument, it’s an unavoidable place to the visit in the village. Enjoy in particular the onion dome, distinguishing feature. 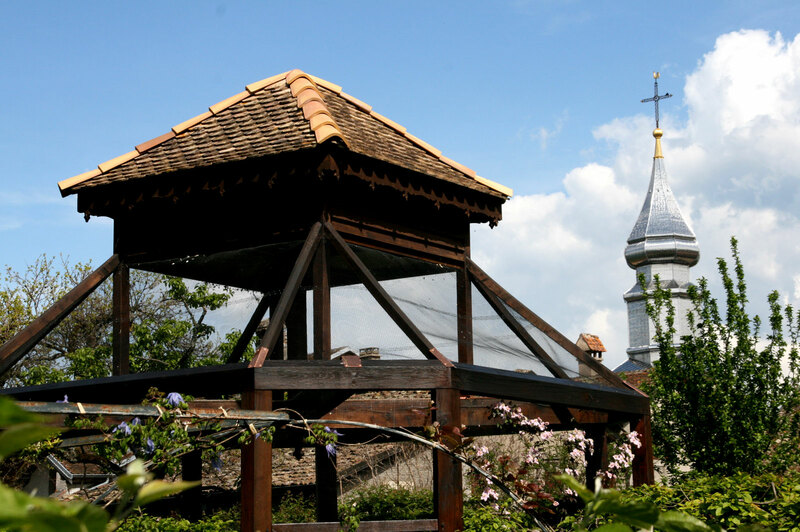 The Church of Saint Pancras in Yvoire with its onion dome is classified Historical Monument. In 1250, the church was submitted to the authority of the nearby abbey of Filly. It is a small vaulted chapel parallel to the rampart located in front of the current choir and presbytery. Between 1536 and 1598, the Chablais was invaded by the Bernese and converted by force to the Reformed religion. The Chablais would be reconverted by Saint François de Sales and the church restored with a baroque altar. The nave, perpendicular to the original chapel, is constructed in the 17th century. The cemetery located in the presbytery garden is moved in 1834 to the outside of the village during the extension of the church in the 19th century. The current onion dome was constructed in 1857, replacing the old campanile. This bell gable, distinctive feature of roman style chapels, had been one of the 800 bell towers of the region to have been destroyed by Albitte during the French revolution in order to dissolve them to build cannons for Napoleon’s army. Repaired in 1934, the bell tower was covered with stainless steel in 1989. This is what gives it this shining aspect, like a lighthouse on Lake Geneva. The top is covered with gold leaves coming from one of the last gold miller in France located in Excenevex, near Yvoire. 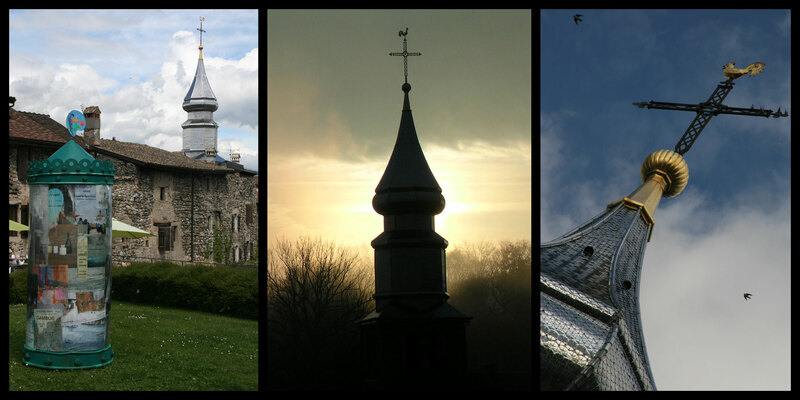 You’ve taken some beautiful pictures of Saint Pancras church in Yvoire? Share your pictures on the Facebook Page of Yvoire or with the Instagram app with the #yvoire hashtag. 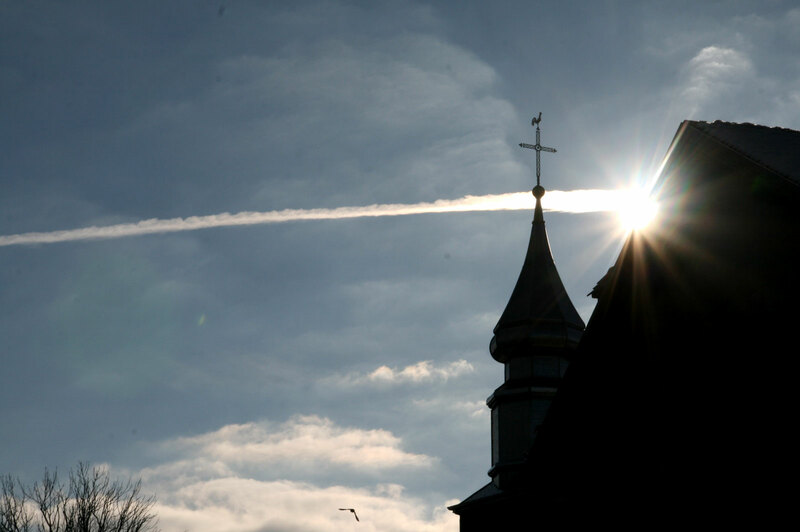 The cross of Saint Pancras church in the sky of Yvoire. 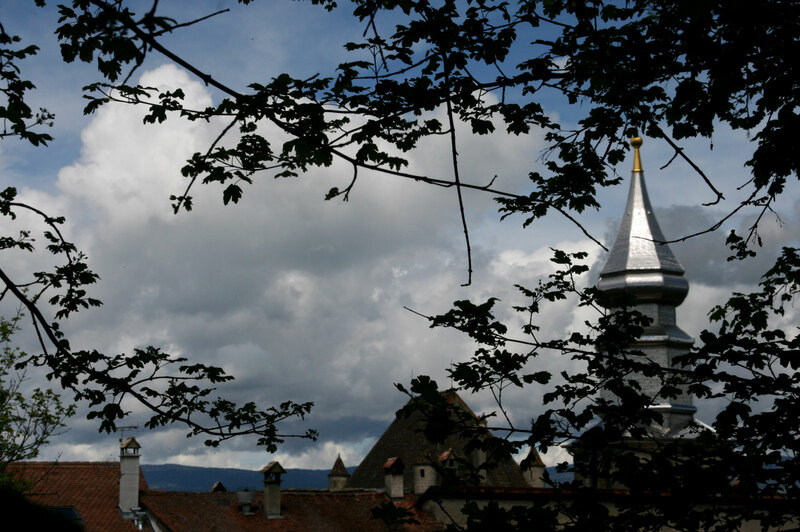 The church of Yvoire seen from the beautiful Garden of Five Senses at the center of the village. Winter back light in Yvoire: the church seen from the fishing port. 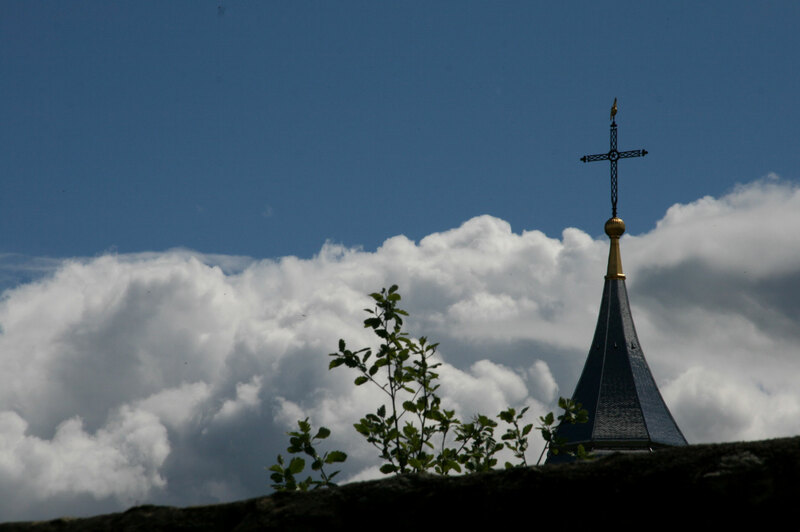 The onion dome of the church of Yvoire is sparking above the roofs of the village. 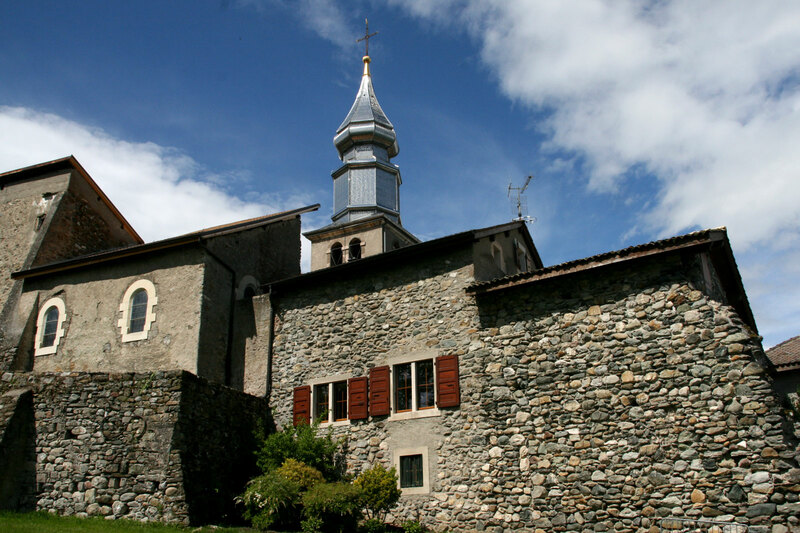 During its enlargements, the church of Yvoire was expanded onto the ramparts of the fortified village. The inside of the church was renovated in 2012 in order to allow visits from people and visitors coming to meditate. The church of Yvoire was dedicated to Saint Pancras, who died a martyr at age 14, in 303, during the persecutions in Rome. Celebrated on May 12, Saint Pancras is one of the patron saints of children. He represents innocence and faith in childhood. His name is from ancient greek and means “the most powerful”.